During the first day of this trimester, I get the parcel directly from the Japan through the EMS delivery service. As I review the stuff, the shogi set is much more nicer than I thought. The big shogi set is Hanayama Honkaku Shogi Set. The whole shogi set is totally made of plastics. The advantage of this shogi set is you no need to worry about the quality, the pieces is made of plastics as it wont be easily crush. Compare to those wood made board and pieces, the plastics is much better as it can last for almost your entire life. There are 2 drawers beside the board to serve as the "Koma-dai" where you can put your captured pieces inside, and also you can keep all the pieces inside the drawers and it is ready to be carry on. And the small one is Tomy Pocketmate Shogi Set. 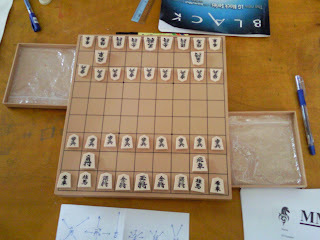 The small shogi set is able to 'save' the game, you can keep the unfinished game and bring it to everywhere. This is the best small shogi set I ever see. Unfortunately the shogi set is not magnetic, so you need to be careful when you going to take a move on the game to prevent it drop off the board.